Situated on the popular Page Hill development a three double bedroom, split level detached house benefiting from a re-fitted kitchen/diner with integrated appliance's, double width block paved driveway and integral double width garage with an electric up and over door, Upvc guttering, down pipes and fascia boarding. The property further benefits from being in catchment, and walking distance to Buckingham Primary, Buckingham Secondary and Grammar Schools. Accommodation comprises: Entrance porch, entrance hall, sitting room, open plan re-fitted kitchen/diner with stable door leading onto the patio and rear garden, three double bedrooms all with built in wardrobes, en-suite shower room, family bathroom with separate double width shower, double width driveway and garage with power assisted door. Front and rear gardens. EPC Rating D.
Radiator, door to integral double width garage. Suite of low flush W/C, corner wall mounted wash hand basin, radiator, wood laminate floor, extractor fan, shaver point. Re-fitted to a high standard to comprise inset single drainer stainless steel sink unit with mono bloc mixer tap and cupboard under, a further range of base, eye level and drawer units all with soft closures, granite work surfaces over, concealed lighting under, ceramic tiling to splash areas, integrated tall fridge, integrated tall freezer, integrated dishwasher, space for range cooker, inset down lighters, cupboard housing "Worcester " gas fired boiler serving both domestic hot water and radiator central heating stable door to patio and rear garden, Upvc double glazed window to rear aspect. Upvc double glazed window to front aspect, double fitted wardrobe with hanging rail and shelving as fitted, radiator, coving to ceiling. Upvc double glazed window to front aspect, radiator, coving to ceiling. Built in wardrobe. White suite of shower cubicle with shower as fitted, low level W/C, wash hand basin, full height ceramic tiling to walls, extractor fan, radiator. Upvc double glazed window to rear aspect, ceramic tiled floor. White suite of panel bath with mixer tap shower attachment, separate double width shower cubicle with "Aqualisa" shower as fitted, wash hand basin with storage cupboard under, low flush W/C, inset down lighters, full ceramic tiling to all walls, ceramic tiled floor, Upvc double glazed window to rear aspect, ladder/heater towel rail. Double width block paved driveway leading to property entrance and double width garage, lawn area with "astro turf" retaining wall, gated side access to rear garden, established planting. 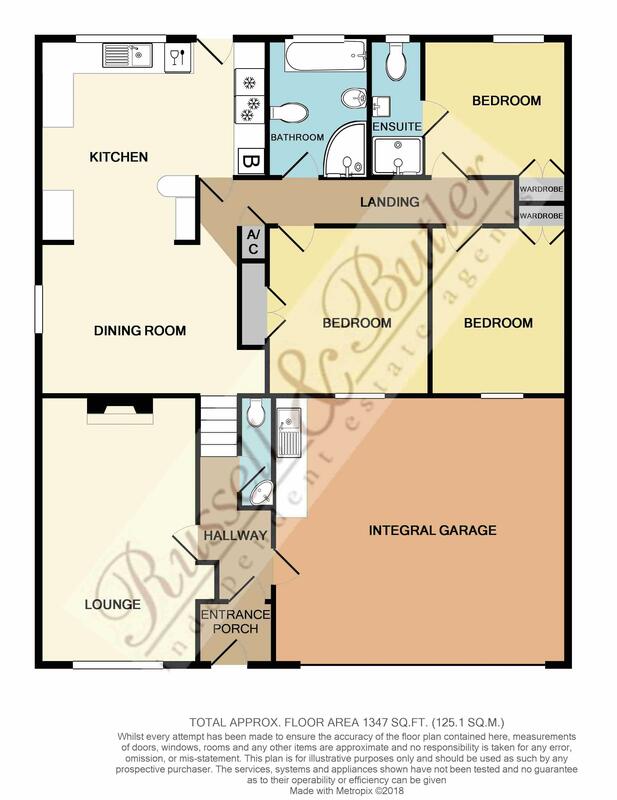 With power assisted up and over door, utility area with worktop and single drainer sink unit, space and plumbing for automatic washing machine, door to entrance hall.